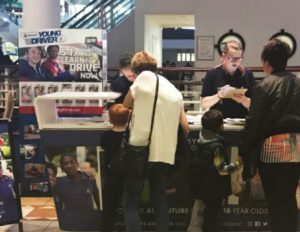 On Sunday 15th October 2017 we were given the opportunity to use a prime location in the intu Trafford Centre Shopping Mall to showcase The Boys’ Brigade in our region and provide information to prospective volunteers and young people about what we can offer. We had a fully branded promotional stand, a new and updated leaflet describing what our organisation offers to young people, adult volunteers and parents. We had goody bags for young people which included a BB branded puzzle sheet highlighting our range of activities in a fun way, as well as other promotional items. We had several volunteers and staff on hand to take enquiries and a number of electronic tablets with an online form where parents and volunteers could leave their details, so they could be sent information regarding their nearest groups after the event. Throughout the day we had an advert played on the giants screens throughout the Mall, held a Buzz Wire competition and had a BB Band made up of young people specifically for the event playing to the shoppers in the food court who received a great response. On the day we handed out over 1000 goody bags, over 2000 leaflets, had over 200 face to face enquiries and around 40 people provided their details using the online forms. Following the event, we have gained some great feedback, and several local Companies have made us aware that they have had new members join. Our thanks go to everyone at intu Trafford Centre for their support and assistance in providing the space to use for the day. We now look forward to seeing what other intu Shopping Centres we can work with in the future and if you know of any attraction in the region where we could host a similar awareness and information event then get in touch with the England and Wales team.